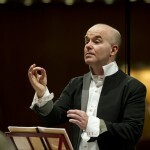 Laurence Cummings is a harpsichordist, organist, and conductor. He is Head of Historical Performance at the Royal Academy of Music (since 1997), Musical Director of the London Handel Orchestra and Festival (since 1999), Musical Director of the Tilford Bach Society, a founding member of the London Handel Players, and a Trustee of the Handel House Museum. Cummings was educated at Christ Church, Oxford and the Royal College of Music and he has studied with Jill Severs. He has appeared with ensembles including Les Arts Florissants, English National Opera, English Touring Opera, the Gabrieli Consort, Glyndebourne Festival Opera, Opera Theatre Company, Orchestra of the Age of Enlightenment, Royal Academy of Music Baroque Orchestra, Royal Liverpool Philharmonic Orchestra, The Sixteen, and Streetwise Opera.